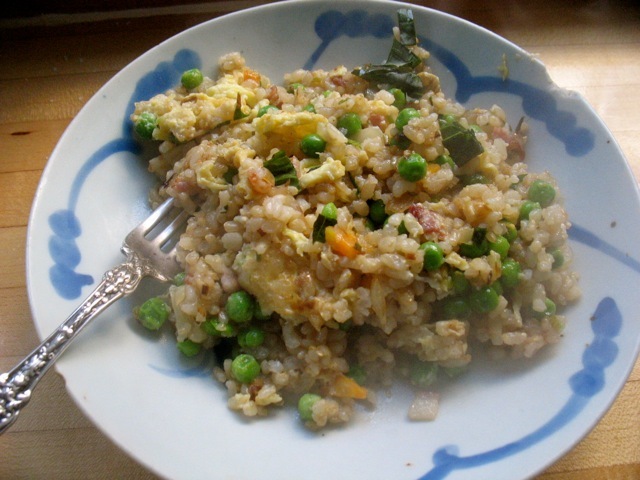 Leftover short-grained brown rice, peas, eggs, bacon, ginger, onion, carrots and green garlic. 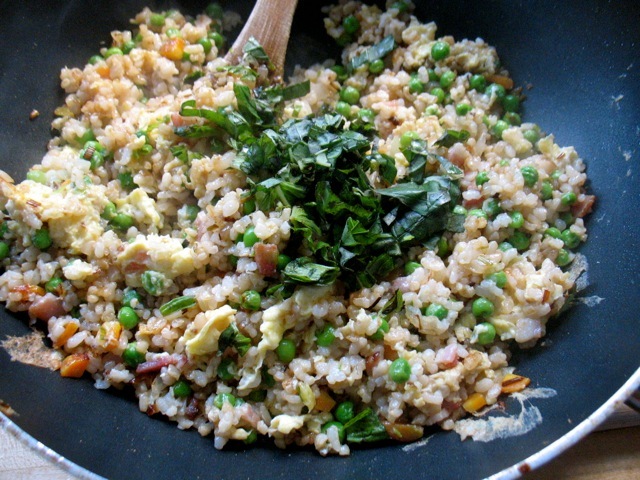 . . .made for a very tasty fried rice. A student of mine turned me onto a classic (as I learned) way of cooking brown rice a few years ago. This method works particularly well with short-grain brown rice and has converted many a brown rice skeptic in my circles. You bake the rice in the oven after adding boiling water, a bit of butter and salt. Tightly covered it cooks away for an hour. And then watch out! I eat too much of it every time. It’s fluffy and buttery and tender and sweet and really just perfect. In any case, I make a big panful of this brown rice whenever I make it since it also makes a noteworthy fried rice the next day (or week or month since it freezes beautifully). Having some cooked, frozen rice on hand is a gift on a busy day. Rice thaws fairly quickly and when re-purposed into friend rice or added to soup or gratin or even a cold salad with a zippy dressing, is hardly any worse for wear. In fact for fried rice to be good you want to use rice that was previously cooked and cooled so the grains are sure to separate nicely. 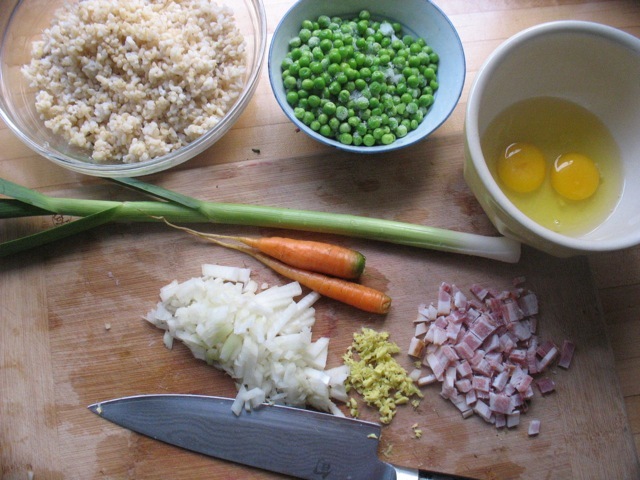 In my kitchen fried rice is another perfect cook-with-what-you-have kind of dish. Whatever bits of vegetables and sometimes meat I have on hand all fry up nicely when cut into small pieces and given plenty of room and heat. Scoot the rice and veggies to the side and scramble a few eggs in the same pan before mixing them in gives it extra heartiness. And any number of fresh herbs tossed in at the end are a bonus. In this case it was basil and mint. Sometimes I add chopped, roasted peanuts and a good splash of coconut milk (unorthodox I’m sure but very good nevertheless). You can scramble a few eggs in one side of the pan and then mix them into the rice. So cook some rice, lots of rice, and then make fried rice or rice custard or tell me what your favorite thing to do with leftover rice is . . . Happy Cooking! This is the quintessential quick dinner, utilizing whatever bits and pieces you have on hand. Asparagus, corn, turnips, radishes, leeks, chard stems, green beans all work well in this dish. Quantities are all approximations and you can vary them as you like. You just want to be sure you cut the vegetables finely and fairly uniformly and you don’t want to crowd your skillet or wok. To avoid a soggy dish you need to be brave with the heat level and steer away from vegetables that give off a lot of liquid like tomatoes or zucchini, though finely diced zucchini would work well with enough heat! Heat the oil in a wok or wide skillet over high heat. Add the onions, garlic, ginger, carrots, Serrano chili, and bacon and cook stirring very frequently for about 3 minutes until the vegetables begin to soften. Add the peas and the rice and mix everything very well. Cook for about three more minutes to heat the rice and peas through. Then push the contents of the pan to one side and add the eggs to the empty spot and scramble them until almost set. 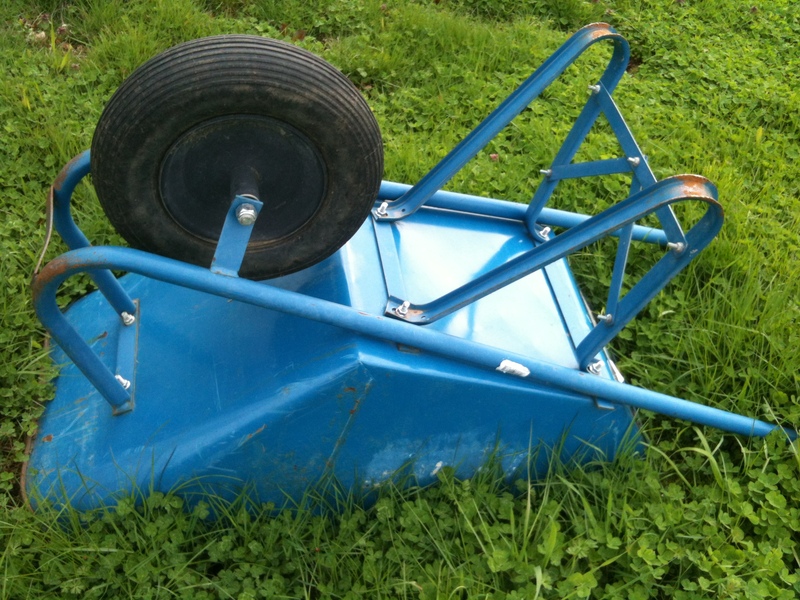 A few stray peas or rice kernels will make their way in which is just fine. You just don’t want to mix the raw egg into the rice right away since you’ll loose track of it as it just coats the kernels instead of scrambling. 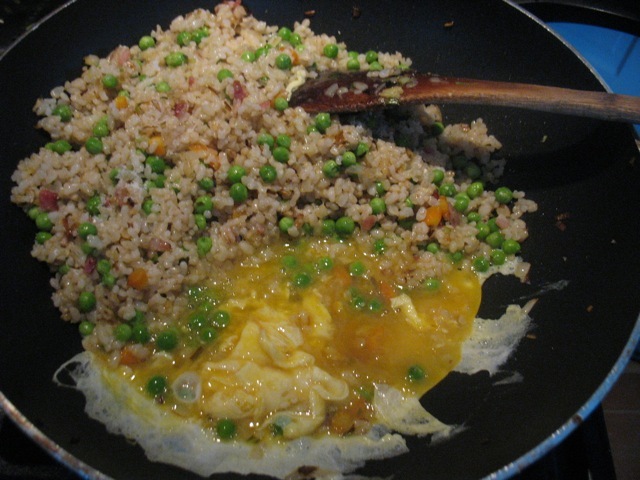 When the eggs are almost set, mix them gently into the rice, add the soy and fish sauce, stir well and then mix in the herbs. Adjust seasoning–it may need salt or more soy or fish sauce or a squeeze of lime juice–and serve immediately. We ate the last quart of frozen berries about six weeks ago and freezer pickings are starting to get a bit slim, as they should be. I am equally as keen on filling that freezer in summer and fall as am to emptying it by late May when the berries in Oregon start arriving. I’ve gotten better at managing quantities of things to freeze based on my families likes and dislikes, my style of cooking and what holds up best in this format. The only thing I miscalculated this year was on roasted Anaheim chilies. I still have a LOT of those left. It may be they are a bit too spicy for my five-year-old or that I just haven’t remembered them at the right time when I was making chili or some other suitable dish. So this week I will be dicing them and adding them to cornbread (recipe below) and savory bread pudding and rice and anything else I can think of. If you have favorite ways to use these Anaheims or some roasted Poblano chilies please share! Roasted chilies, tomato jam, pesto, applesauce and roasted tomatoes. I managed the quantity of my frozen, roasted tomatoes well this year since with our cool, wet spring we won’t be seeing tomatoes in the market for a good while. I have enough for a few more sauces or soup bases and for quesadillas and sandwiches. As I canvas the nearly empty freezer I am reminded of the privilege of “going shopping” in the basement freezer and how that one last jar of pesto will mean dinner can be on the table in 15 minutes or that tomato jam that’s a little spicy, savory and sweet will grace some “Daddy Patties” or a hamburger next week. All that incremental work of stocking in small batches as I have extra in the peak of the season is rewarded over and over again. 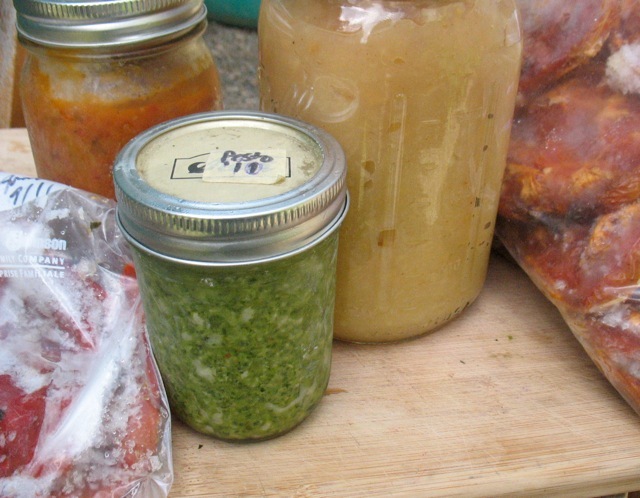 I have gotten better at labeling frozen items over the years, though last week, a container marked rhubarb compote, that I had been saving for dessert for a recent cooking class turned out to be cooked Pinto beans. So while the freezer has turned up a few surprises like that its contents have mostly served as constant inspiration, reminder of summer flavors, and in-house grocery store. And this time of year, as the new growth of spring gains traction I will start “shopping” more in the backyard for things like this, that pair nicely with the dregs of the freezer. 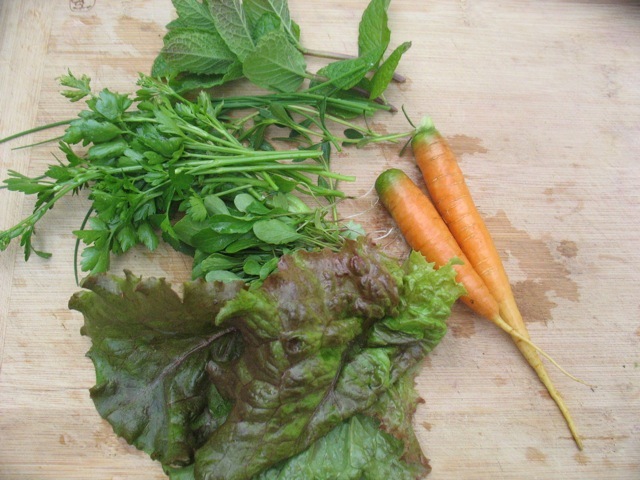 Lettuce, arugula thinnings, parsley, chives, mint, and carrots. I make this for dinner regularly. It’s very quick and nothing beats warm cornbread for dinner. It’s really best within a few hours of baking but it never lasts long around here. This version has chopped, roasted chilies, sharp cheddar and black pepper in it. However, if you omit those, you get the plain, traditional one I love too and typically make in a cast iron pan. You can certainly make this version in a cast iron pan too and skip the muffin tin. Melt 4 tablespoons of butter and let cool slightly. Combine cornmeal, flour, baking, powder, salt, pepper and cayenne (if using) and sugar in a medium bowl. Whisk the egg and milk together in a small bowl. Add melted butter and milk mixture to dry ingredients along with cheese and chilies and stir quickly. Do not over mix. If you’re making muffins, brush the tin with melted butter (the remaining 1 1/2 tablespoons) and fill the cups 3/4 full and bake for 10-12 minutes or until a toothpick comes out clean. You really don’t want to overbake these. Or heat a 9 or 10-inch cast iron frying pan over med-high heat. Add the remaining 1 ½ Tbs butter to the pan. When the butter is melted and foaming pour the batter into the skillet. 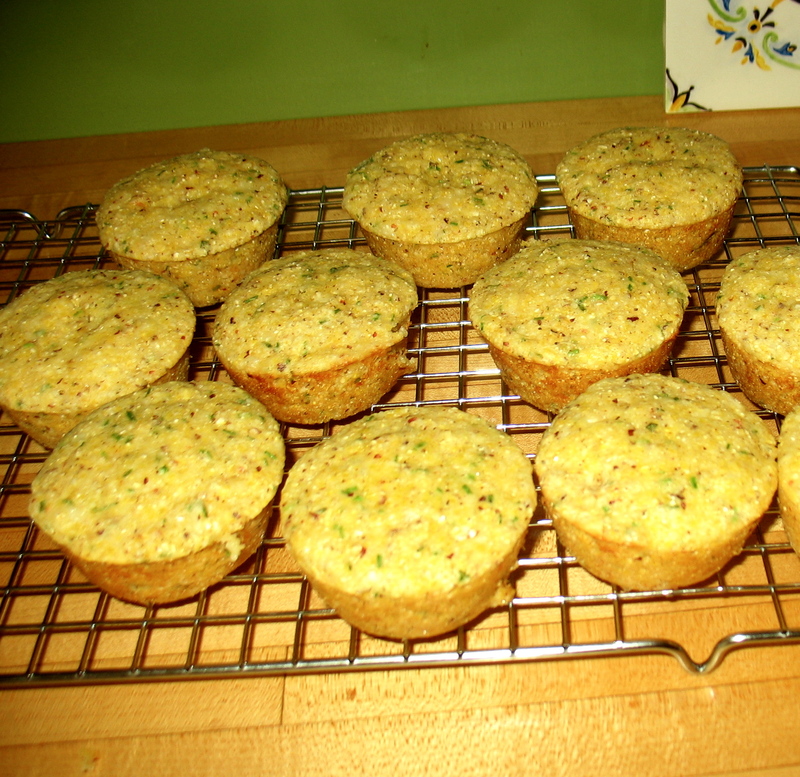 Bake until the corn bread is golden and a knife inserted in the middle comes out clean, between 15 and 18 min. Serve hot out of the oven. Corn muffins with roasted chilies and cheddar. Posted on May 2, 2012 | by cookwithwhatyouhave | Leave a Comment on Why Do You Cook? I spend a lot of time talking to folks about what prevents them from cooking. . . the many barriers, challenges, hurdles folks face daily. But since my goal in life is to have cooking be a regular, rewarding, fun and creative part of people’s lives, I think a better question to you, all of you, might be why DO you cook? It’s a similar shift my brother has applied to his study of home energy use. People always study the homes that waste a lot but no one seems to think of studying the folks who use very little. So, study/talk to those who are already doing it and see what we can learn to help the rest of us along. So, why do you cook? Please comment below. As for me . . . Sometimes I cook because it’s a way to get a break from my tired and cranky five-year-old. . . .if my hubby is home or I can get him, the 5-year-old, to play by himself. Sometimes I cook so I can cook with my five-year-old. Sometimes I cook because a once-lovely bunch of kale is about to go bad and I’ll feel guilty if I don’t use it up. I cook so that I can justify my baking habit (to myself). Sometimes I cook because I love the challenge of making something with seemingly nothing and feeding the family on it well without spending much of anything. Usually I cook because we need to eat, of course, but even though I may not want to, the process usually expels any crankiness I started with. Sometimes I cook because the pot of mint that seems to be growing by the hour in my backyard inspires me to use up that bedraggled half of a cabbage in the vegetable bin in the form of a slaw. Sometimes I cook because I need a gift for someone. I cook because I like to garden and I like to garden because I love to cook! I cook because it makes me feel useful. And regarding that point about cooking so I can justify all my baking. .. recipes like this are exactly why! And regarding that point about loving to cook. . . here you can watch me making one of my favorite weeknight, kid-friendly and crowd pleasing dishes; part of new project called Food Farmer Earth. Happy May and happy cooking!